Women mathematicians across the world are uniting to promote women in mathematics, but this advancement differs in each region of the world. Members of the International Math Union’s Committee for Women in Mathematics, a group within the International Mathematics Union, closed out the first-ever World Meeting for Women in Mathematics – (WM)² with thorough updates on the progress of women’s math groups around the world. 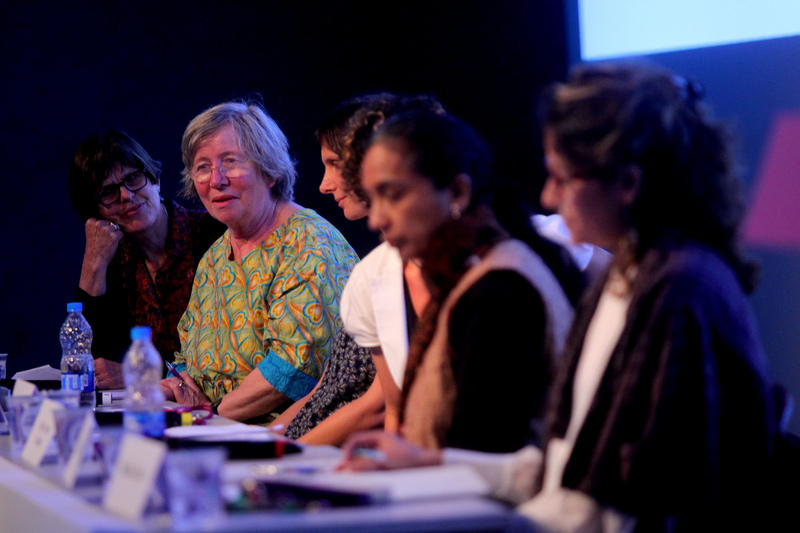 Christina Brech (Brazil), Magnhild Lien (United States), Marie-Françoise Roy (France), Marie Françoise Ouedraogo (Burkina Faso), Riddhi Shah (India), Natalia Garcia (Mexico) gave updates. Christina Brech presented the nascent organizing work of Brazilian women in mathematics. When Brech returned to Brazil from the 2014 ICM, in which Maryam Mirzakhani became the first woman to win the Fields prize, there were still few women in attendance at Brazilian math conferences. So in 2016, she and several Brazilian women initiated the Brazilian Network of Women in Mathematics. The group wants to address the following issues: unconscious and conscious bias; maternity and careers; moral and sexual harassment; the representation of the black woman. Although it is still informal, the group initiated several meetings and events throughout Brazil. Marie Francoise Ouedraogo of Burkina Faso represented the African Women in Mathematics Association, a young group that was formed in July of 2013. Today it has representatives from 32 countries throughout Africa. She said women in Africa face the following issues: financial difficulties, few role models, poor representation, family obligations and general lack of support. With family obligations, many African women tend to stop their schooling after graduate school to have a family. Ouedraogo also said the group will produce a booklet featuring African women in math. The European Women in Mathematics group was founded in 1986 right after the ICM in Berkeley, California. According to Marie Francoise-Roy, it has over 500 members in 34 countries. One of its goals is to make the concept of women in math normal. Its biggest challenge is the differences in participation among countries; there are very few participants from eastern European countries. In the future, the group plans to create math research centers. The Indian Women in Mathematics group launched in 2009, just before the International Congress of Mathematics in 2010 in Hyberdad, India. Right now the group holds annual conferences and offers grants for training. Hundreds of women participate nationally and even internationally (Nepal for example). Riddhi Shah said she wants more participation from women in eastern and central India. Magnhilt Lien presented the work of the Association for Women in Mathematics (AWM), an American group that attracts students and professional women in academia and the math industry. AWM has a 47-year-history. The organization offers travel grants, conferences, a Biennial AWM symposium, prizes. Its next conference will be held in 2019 at Rice University. Natalia Garcia closed out with an update on the networks of Latin American Women in Math, which was created in 2016 and consists of groups of women throughout Latin America and the Caribbean. Garcia listed the following goals of this network: Convince people in their respective countries that there should be more women in math, eradicate sexual harassment, gather more info on women in math and collaborate with other. The small independent groups in Chile and Brazil are focused on local events that support women. Groups in Mexico and Colombia are more centralized and are committees within existing math groups. These groups will hold a second meeting in Chile in 2018 and a third meeting in Colombia in 2020. After these presentations, women from the lunch working groups presented their group recommendation to improve the experiences of women in mathematics.